While life has been busy, my schedule wasn't the only thing keeping me away from this space. I'm not sure how often you read the news, but many terrible, tragic, awful, and rage-inducing things have been happening across America and the world. The attack on a gay club in Orlando, the shooting of unarmed black men, the assassinations of police officers, the terrorist attacks in Europe, the Republican National Convention - clearly, it's been a tough summer. Sometimes, as the world appeared to burn, I wanted to fire up my blog and ramble about books and writing and the beach, but I couldn't bring myself to pretend everything was fine. Of course, I'm still living my regular life (albeit it with a daily dose of horror). I'm going to work. I'm hanging out with friends. I'm reading and drinking and going to the gym and writing. I was busy with a lot of good stuff in June. But living a lucky and privileged life is one thing - bragging about it on the Internet is another. Instead, I kept quiet. Listened and learned. Tried to understand the world we're living in and how to make it better. I don't have any answers yet. I suspect it will be a while before any of us do, and that a lot more terrible things will happen before the good stuff makes a comeback. In the meantime, I will keep learning, keep listening, keep trying. I was going to end this post with a list of fun things that happened in June (because, as I said, it was a fun month for me personally) but I think I'll save that for another day. More soon, I promise. Until then, take care of each other. 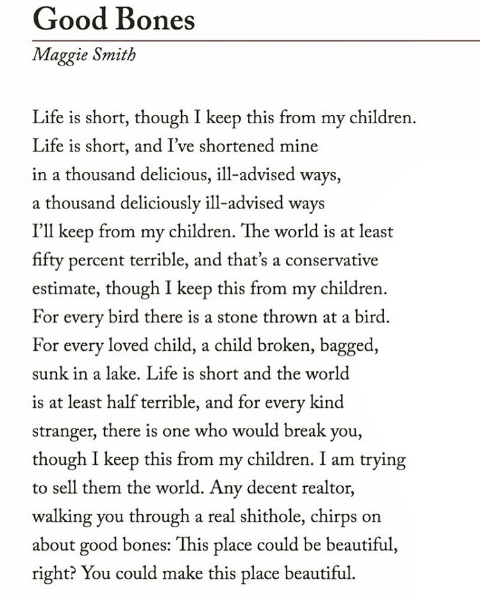 In the meantime, read this poem, originally published in Waxwing Journal, which was the very best thing to happen in June.